Silver and gold price movements are historically highly correlated, but in a week where gold pushed back over the $1,300 mark, silver has sputtered out and fallen below $20 an ounce. At yesterday's close for 24-hour spot silver, silver prices this week were down about 1.8%, falling from around $20.30 to $19.95, while gold was up 1.5% from $1,294.20 to $1,313.00 an ounce. Precious metal investors are highly sensitive to negative economic news. 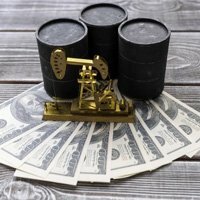 Foreign policy crises, such as those being observed right now on the Russian and Ukrainian border or in the Gaza strip, for example, will have investors pour into the precious metals on fears that tensions overseas will rattle equity markets. Similarly, when there is any indication that inflation will accelerate in the near future, as is the case when U.S. Federal Reserve Chairwoman Janet Yellen holds steady on highly accommodative and stimulative monetary policy, investors move into these vehicles as protection against a weakening dollar. Gold is the premier investment in the precious metals complex, and the default choice for many safe-haven investors. But when traders begin buying gold, silver gets residual investment interest. Because silver volume is a small fraction of gold's it tends to be more volatile, subject to more pronounced surges in bullish times, and more devastating losses in bearish times. "Once the trend is established, silver starts getting buyers, it starts to outpace gold because it's a smaller capitalized market," Chief Operating Officer (COO) of Asset Strategies International, Richard Checkan told Money Morning. "It's like a throwing a rock into a lake versus a puddle, the relative splash is much bigger in the puddle." This was clear in the last big precious metals rally that happened in June. 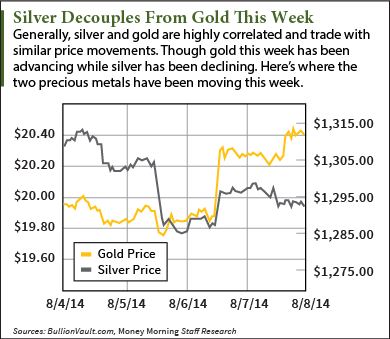 On the month, gold prices rallied 6.2%, while silver was up 11.9%. But in the bear session that preceded it, from silver's peak in February to its trough in early June, silver lost 14.8% while gold only dropped about 7%. What's Moving Gold but Holding Back Silver?